Karan Johar's production venture,' Kalank' finally hit theaters today. With big star cast including Varun Dhawan, Alia Bhatt, Sonakshi Sinha, Madhuri Dixit, Sanjay Dutt, Kalank is one of the most anticipated release of the year. 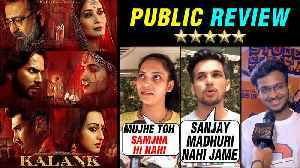 After treating audience by teaser and three beautiful songs, the makers of Kalank has finally dropped the much anticipated trailer of the big cast ensemble film. After teasing fans already with series of pictures from sets and also revealing the look of the cast of the most anticipated film Kalank, the makers have have finally dropped the teaser on Tuesday.